Census Bureau of USA which looks at the population of the country forecasts that the growth of the population would be more than 1% per year for the next 15 years. There would be additional 42 million adults in the country by the year 2025. Supporting the data there would be approximately 2.6 million users of passenger vehicles across the country. United States of America is a developed country whose economy is continuously growing consistently over the years. USA is the world’s largest national economy. GDP is estimated to be $18.124 trillion. USA consists of large reserves of natural resources, fertile soil supported by highly developed infrastructure. USA has the world’s 9th highest per capita GDP. The currency of the country is USD which is considered as the one of the global currency. The people of the country have the highest average household and employee income among OECD nation. USA is one of the largest producer of oil and natural gas. It is the 2nd largest manufacturer in the world. 128 companies among the top 500 are headquartered in US. New York Stock Exchange is the largest stock exchange trading the highest number of shares in the world in terms of volume and value. It enjoys to be the largest consumer market in the world. The labour market has attracted immigrants from all over the world. However US has the highest immigration rate in the world. The above diagram provides the information of the major cities in the country. This major cities are responsible for providing job opportunities. Technology, infrastructure and transport have supported the development of the cities. The main reason of development of the cities is the availability of the resources across the states. The government invests in the improvement of the rural and semi urban regions so that there is better accessibility of the resources. The country is having one of the highest number of skilled people in the world. The labour report of the country accounts 154.4 million individuals who are employed in the country. Majority of the employment is provided by the 30 million small businesses which accounts 53% followed by the large businesses which holds 38%. The private sectors employs 91% of the working population followed by the government which is 8%. United States is the third largest country in the world in size which comprises of 13 colonies. USA is covered by North Atlantic and North Pacific at the east and west followed by Canada in the north and Mexico in the south. USA ranks third in the world by area with eastern regions of hills and low mountains with west having high mountain ranges. Central region consists of vast plain. United States is considered to be one of the technologically advanced country in the world. Geography, social and economic conditions have played a vital role in the development of technology in the country. Government investment in technology followed by the skilled availability of the skilled labour led to the development and growth of the industries associated with technology. Technology has been the supporting hand for the industrial revolution. USA ranks as the top country in innovation index. The needs of the country’s economy can be supported by the infrastructure. Highways which is about 6,348,277 kilometres connects the entire the country supporting the passenger vehicles as well as heavy vehicles carrying heavy goods and materials. There are highly developed ports build across the canals carrying goods within the country as well as across the globe. It is one of the busiest working ports in the world. Telecommunication system is widely spread across the states with a highest number of fiber optic cables connectivity. The industries and household power is generated by the fossil fuel, atomic power, wind, water and solar power. The most preferred mode of transport in the country is car. The most preferred medium of transport for intercity travel. Smooth roads connecting cities, towns and rural locations have helped increase the number of auto vehicles in the country. Easy accessibility of loans, fuel and car technology have led to the increase in sales of cars. The most preferred mode of transport is the cab facility connecting each and every corner of the cities. The fares of taxi which are running in the city are higher with higher costs of gasoline and that are popular tourists and business destinations. The basic reason of taxi fares used by the passengers is the connectivity. The technology have added value to the demand of car travel such that the customer can book a cab for reaching to the destination. United States consists of many national and international airports. The USA airlines transport nearly 2 million passengers every day within the country and across the globe. One of the most important mode of transport used by the people of the country because of the reach, accessibility and the speed. Almost all towns and cities have local or county airport. Commercial airlines contributes significantly to country’s GDP which is nearly 8%. There is an average reduction of the operation costs by 6% y-o-y which results in the competitive prices of the tickets. Airway companies provides different schemes for the regular customers who board flights travelling across the country. The above map shows the airports in the states which brings the entire country together. The cheapest medium of transport across the states. Bus transport is considered as the secondary mode for travelling. This medium basically carries commercial passengers from different parts of the states. The bus industry has been divided into niche segment servicing to specific group of people and another for leisure activities. The bus services is dominated by the local players who controls the route and frequency of the bus. Interstate travelling is done by booking process provided by the companies at competitive prices. Bus operates 24 hours a day. Bus companies are including toilet, reclining seats and tinted windows to add value to the bus traveller. The highest frequency of the bus route for commuters is found within the city. Buses cover the commercial places in the city as well as the tourist destinations. The above diagram shows the bus route of Greyhound which is the one of the company providing bus services to the people in the country. USA ranks 1st of having the largest railway network having a route length of 2, 50,000 km followed by China and India. Rail transportation consists of movement of goods and passengers across the states in the country. The railway connects all the important cities of the states. Rail service helps connect the rural communities connect different parts of the country and help reducing road traffic in major cities. High speed rails has supported the connectivity across the states. The journey of high speed rails is faster than road transport. Along with connecting commercial hubs of the states, it also connects the vacation destination in the country making it more popular for the people to commute via rail. The above diagram shows the railway network connecting the east, west, north and south of the country. Rail traffic network has overtaken by automobiles and airplanes. With the increase in the high speed rails, the passengers are preferring more rails for travel. The diagram represents the research conducted by the American Household Survey which states that the majority of the population is living in the semi-urban and rural locations which holds 71% whereas 29% of the people residing in the cities. 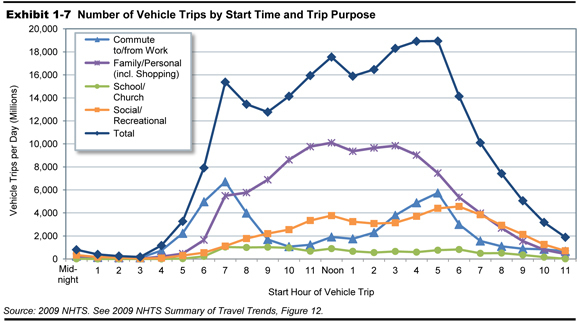 26% of the urban population did not have vehicles of its own and used public transport for the travel. The research also revealed that 53% of the population had the access to the public transport and 9% used it regularly. The above data shows that the vehicle user per family has been gradually increasing over the years and the trend seemed to be consistent with the average of 2 vehicles. New private companies are entering the commercial car market to provide cab services to the people at affordable prices. The government is providing vast area and to the rail companies for increasing the rail network in the country. The government is investing huge amount of resources for bullet trains which will increase the speed of reaching every corner of the country. The government is allowing more FDI in the airline industry for more accessibility of flights in the region. Development of more airports in towns are made for airways travelling of the passengers. More buses terminals are getting added every day in the busiest places so that the people can optimise the bus services connecting to different places. New technology like electric cars are being developed in the country, as the demand for clean energy vehicles is increasing in the country. More and more towns are getting developed as a commercial hub leading to increase in the workforce. Tourist destination are made across the countries for increase in the movement of people to this location. Government is bringing more policies for the passengers for safety and security travelling through various mode of transport.